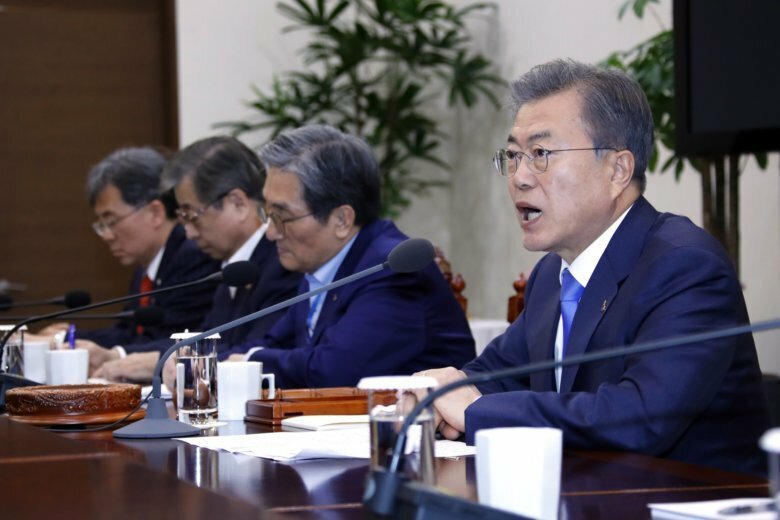 The proposal for the talks came during a National Security Council meeting on Monday led by South Korean President Moon Jae-in, who said it was Seoul’s “outmost priority” to prevent nuclear negotiations between the U.S. and North Korea from derailing. At the meeting in Seoul’s presidential palace, Foreign Minister Kang Kyung-wha said the proposed talks, which could include civilian experts from the U.S. and South Korea, would help settle differences over how much sanctions relief Washington should provide North Korea in exchange for nuclear disarmament steps. Last week’s meeting between Trump and Kim in Vietnam broke down over what the Americans said were North Korea’s excessive demands for sanctions relief in exchange for a limited offer to shut down its aging main nuclear complex in Yongbyon. North Korea reportedly has other sites producing weapons-grade uranium hidden around the country. Kang said the core issue is determining what disarmament steps North Korea could be persuaded to take in exchange for sanctions relief. Moon lobbied hard for the revival of nuclear diplomacy between the U.S. and North Korea following elevated tensions in 2017 over North Korea’s missile and nuclear tests and Trump’s threats to bring “fire and fury” on the North. Some experts say the breakdown of the Trump-Kim talks in Vietnam raised further doubts about Moon’s claim that Kim is genuinely interested in dealing away his nuclear weapons and about Moon’s role as mediator. “We hope that both countries will continue their dialogue and that their leaders meet again quickly to reach an agreement that was held off this time,” Moon said at Monday’s meeting, which was also attended by the prime minister, spy chief and ministers of defense and inter-Korean affairs. “In the process, our role has become important once again,” Moon said. “While I believe the United States-North Korea negotiations will eventually reach an agreement, it’s never desirable for a vacuum in dialogue or stalemate to be prolonged,” he said, urging South Korean officials to find ways for the U.S. and North Korea to narrow their differences. Moon said South Korea will continue to push ahead with engagement with North Korea within the boundaries of U.S.-led international sanctions against the North. Moon has prioritized stabilizing bilateral relations with North Korea amid the larger nuclear negotiations between the U.S. and North Korea, saying inter-Korean reconciliation will drive progress in nuclear talks. But his call for partial sanctions relief to encourage nuclear disarmament steps by North Korea has caused disagreements with Washington, which does not want to give up what it sees as its main leverage with the North. Moon’s government plans to hold discussions with the United States over the possibility of restarting operations at a joint Korean factory park in the North Korean border town of Kaesong and tours by South Koreans to the North’s Diamond Mountain resort. These projects provided much-needed cash to North Korea before the South shut them down during past periods of tensions. While Moon’s spokesman said South Korea will see if there’s any possible way to restart the projects under the “framework” of current U.N. and U.S. sanctions, experts say that would be impossible. The U.N. Security Council has so far restricted sanctions exemptions to non-commercial infrastructure projects and would likely need to pass an entirely new resolution on North Korea for inter-Korean economic activities to resume, which is difficult to imagine until Kim takes deeper steps toward completely and verifiably relinquishing his nuclear weapons, said Lim Soo-ho, an analyst at the Seoul-based Institute for National Security. Under U.S. laws, Trump would need to go through an involved process to soften U.S. unilateral sanctions against the North, which would put South Korean companies doing business in the North under the threat of U.S. boycotts. Moon helped set up the first summit between Trump and Kim last June in Singapore, where they issued a vague aspirational statement about a nuclear-free Korean Peninsula, without describing how or when it would occur. Moon said the collapse of the second Trump-Kim summit was “very regrettable,” but the talks were still meaningful because they included specific discussions of disarmament steps, sanctions and the possible establishment of liaison offices. Washington and Seoul announced on Sunday that they will eliminate massive annual springtime military drills and replace them with smaller exercises, in what they called an effort to support diplomacy with North Korea. On Monday, their militaries began a new computer-simulated exercise dubbed “Dong Maeng,” or “Alliance,” which runs until next Tuesday. Some analysts say the conversion to smaller exercises and simulations will weaken the allies’ military readiness when North Korea has yet to take real steps toward disarmament.